Professional cricketer - Reece Topley came into school to give some coaching to some of our promising bowlers in years 5 and 6. Reece gave the children some expert advice on bowling faster and more accurately. He bowls left handed and very fast for Essex and has played for England under 19s. Reece also spent time answering questions and signing autographs. Our first ever inter-house team chess tournament reached its conclusion yesterday. The last set of matches were very close with Hitcham and Bulstrode finishing 2 wins each. Howard and Mills also drew 2-2. Over the 3 weeks each team had played each other. The final results saw Howard finished 1st with 7 points. Mills were 2nd with 6, Hitcham 3rd with 6 points and Bulstrode 4th with 5 points. The children are grateful for the introduction of the house chess competition - giving them further opportunities to play matches. They would also like to thank Mr Byer for giving up his time on Monday lunchtimes to run the competition. We are not issuing a school newsletter this week, the next letter will be circulated on Tuesday 5 May (day after the Bank Holiday). The Year 4’s have been to the annual Suffolk School Farm Fair and Country Show held at Trinity Park. This event is like a mini Suffolk Show for children and aims to educate Suffolk school children about farming and food production in Suffolk. 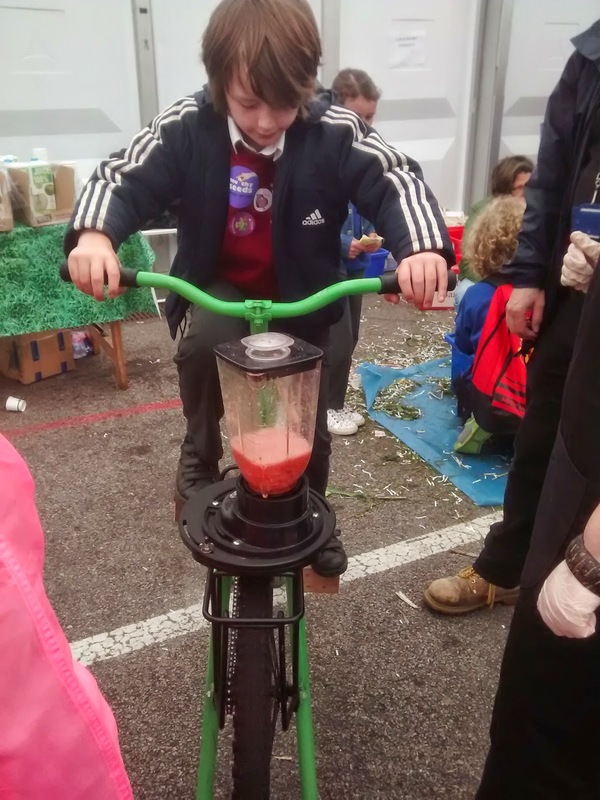 Our children enjoyed holding chicks and ducklings, eating various food samples, seeing the Air Ambulance, watching sheep shearing and making smoothies on a bike as well as lots and lots of other things. It was a fabulous day! We have recently added some new APPs to our school tablets. This one is called: My Piano. It is great for learning how to read music or learn about a keyboard. The children can even record their tunes. The keyboard can be set for different instruments as well. Even more impressively - a boy from Class DB has programmed his own keyboard using the Scratch software that we have been using in school over the last 3 years. Watch the video below of Josh using his keyboard on a laptop. On Thursday mornings we have been lucky to have a visiting Yoga teacher working with a number of classes. The children (and staff) in year 6 have really enjoyed the sessions - they have helped us relax in the build up to the SATs tests. This Tuesday saw our after-school cricket club using our new nets. We had over 50 boys and girls with 4 staff using the facilities in beautiful Spring weather. The children have also been using the nets at lunchtimes throughout the week. 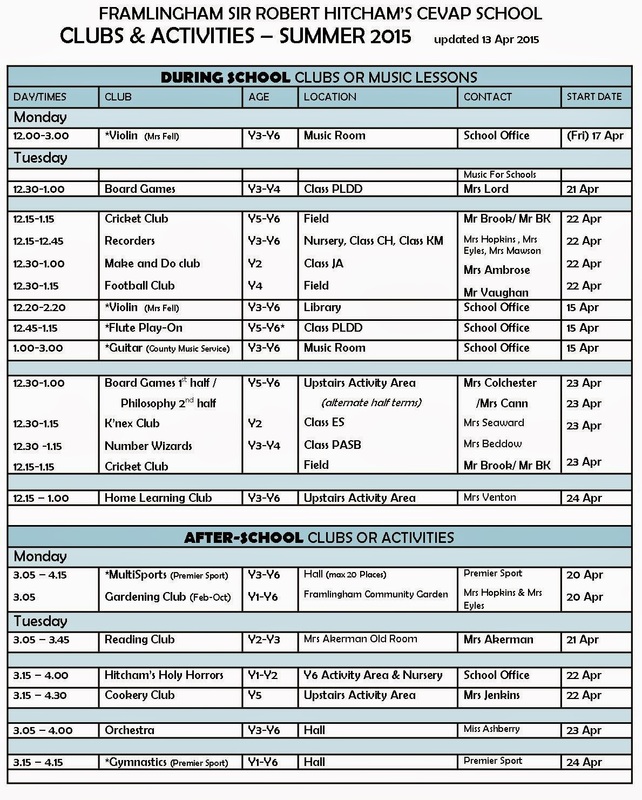 Our inter-house league will start in the next few weeks. We are very sad to let parents and children know that Miss Ashberry will be leaving us at the end of the summer term to take up a teaching post at Eye Primary School. We will be very sorry to lose her from our teaching team, but wish her every success with this move and her future. We are happy to announce that we have appointed Miss Bullock who will join the team in September. EATs catering are providing a St George’s Day lunch THIS THURSDAY. A traditional Roast Beef lunch with Yorkshire Puddings, followed by a St George’s Day Iced Cake. With this letter please find a Scholastic Book leaflet. Orders should come back to the office by FRIDAY 1 MAY. Please remember we cannot accept cash for this, only cheques (payable to Scholastic Ltd) or complete their credit card slip. Thank you. Those children in PLDD who currently learn the clarinet have the opportunity to continue with the same instrument from September in a small group weekly lesson for a small fee. We will be sending letters out to the class shortly, and would appreciate if everyone could respond whether they wish to continue or not. The children who currently do Flute Play-On can continue again for another year, and will also get a letter shortly. HOW TO HELP YOUR CHILD SHEETS Teachers will be handing these out to all children over the coming week. Please take some time to read these to help you understand what your child will be learning about at school this term, and about ways in which you can support them. As per the Uniform list that was included in last week’s letter, we just would like to advise parents that we will be using nail varnish remover to remove any nail polish from the children. This is for mums, dads and /or carers of children aged 6-12 years. This is a step by step course, running for 2 hours per week over 12 weeks, starting 22nd April. There are still a number of invoices outstanding for Violin, Guitar & Flute so please ensure you have paid for the terms lessons this week, otherwise your child may not get a lesson. WHO IS COLLECTING YOUR CHILD? Please can we remind parents to advise the teacher if someone different is collecting your child after school? If there are a few adults who occasionally collect your child (eg Grandma/ Auntie/ Friend) you can give the teacher a note saying “I give permission for …., etc to collect my child if I am not there to pick them up”. This is also relevant for collections from after-school clubs. If you want to give permission for your child to walk home alone, you will need to fill in the relevant form that can be found on the website (Parent Information page) or from the office. Please can we remind parents that the children should only be bringing in fruit or vegetables for their morning snack. Please DO NOT include packets of processed or coated fruit eg fruit winders or yoghurt coated fruits. Thank you for following our ‘healthy schools’ guidelines. More details can be found in our Sun Protection policy. We are finding that a number of children are wearing non-school colours or items. School Sweatshirts embroidered with the school logo are available to order from the ‘Friends’ via the office, as are a number of other items. No other sweatshirts/jumpers should be worn. If your child wears a cardigan rather than a sweatshirt this should be in the school maroon/burgundy colour not in red. Children should wear shoes which are comfortable and practical, preferably in black. Sandals are allowed in summer in school appropriate colours they must have an ankle strap and be worn with socks (No Flip-Flops or Crocs). Footwear that covers the ankle e.g. boots should not be worn. Jewellery and nail varnish should not be worn. Earrings can cause problems during PE and Swimming and your child will be asked to remove them before the lesson. Stud earrings are the only type allowed. Children will also be required to remove watches before games lessons. Sun hats are recommended during the summer months, and also an application of sun cream to your child's arms, legs, face and neck. has spaces for 6-11 year olds on Thursdays (starting 23rd April) at St. Michael’s Rooms in Framlingham, 4pm – 5pm. Come along for a free trial session! Contact Ali on 07867807144 for further info.